Don’t you just hate being misled by catchy titles that spark your curiosity? These are called clickbaits and are used all around the internet. And the reason they are so popular with content creators is that THEY WORK. As you might assume by now, nothing spectacular happened, not to me, anyway. This post is about grabbing attention in social media (and further). Click bait is a pejorative term describing web content that is aimed at generating online advertising revenue, especially at the expense of quality or accuracy, relying on sensationalist headlines or eye-catching thumbnail pictures to attract click-throughs and to encourage forwarding of the material over online social networks. Clickbait headlines typically aim to exploit the “curiosity gap”, providing just enough information to make the reader curious, but not enough to satisfy their curiosity without clicking through to the linked content. Clickbaits tap into people’s habit of reading headlines on their feeds (be them social media or news-feeds) and they make sure they are that sensational that they receive a click once read/viewed. Most commonly, titles have something marginal to do with the content of the material your are directed to. They are deliberately vague so as not to be dismissed as lies, but in fact they are. Networks such as Buzfeed or Upworthy are well known for their extensive use of clickbaits, while Facebook has openly declared it is fighting against them. Their algorithm is trying to track clickbaits by analyzing the time spent on the clicked link and the amount of positive feedback the post gets on the platform (shares and likes). Facebook’s fight against clickbaits has been announced around 2013, but I am not sure it worked that well. What do you think? 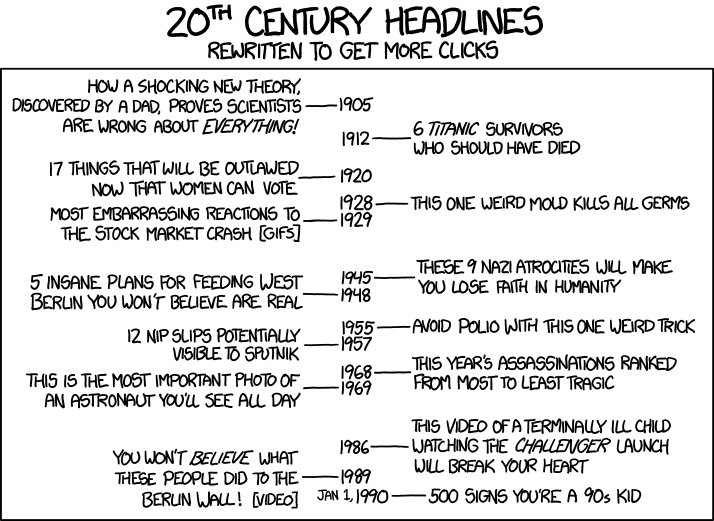 Here is what 20th century headlines would look like if written today. standard monetizing of web traffic has put more focus on the number of page visits than on actual time spent on an internet page and/or the quality of the experience people have on a certain web page quantified through actual user feedback. There’s plenty of other explanations, but then again, there are bigger problems in the world than clickbait, so I will stop here. My aim was to make you a little more aware of the internet slang and give you a glimpse into the problematic. While for the majority of us this is a marginal although rather annoying issue, for some clickbait is their job and source of income. ← Do you know what VidCon is?